Vindicia>Blog>Understanding credit card merchant fees: What are you paying for and who are you paying? If you have a small business or are thinking about starting a business - perhaps an online business with a subscription-based business model - and you would like to accept credit and debit cards, you might not know exactly which credit/debit services you need and how much they should cost. And if you have already reached out to the credit card companies, you might not understand exactly what they are offering you and what precisely you are being charged for. That is totally understandable, because the charges you incur can be many and not necessarily easy to grasp. Many explanations available online are detailed, confusing and inundated with industry jargon. In this post I have summarized in layman's language how the credit card ecosystem works, and the key concepts, terms and charges you need to be familiar with in order to deal with the various players you must engage with – and how to get the best deal. The customer or card holder: This is the person making the purchase. The purchase can be online or in person. It may also be a one-time payment or a recurring payment such as a monthly subscription charge. 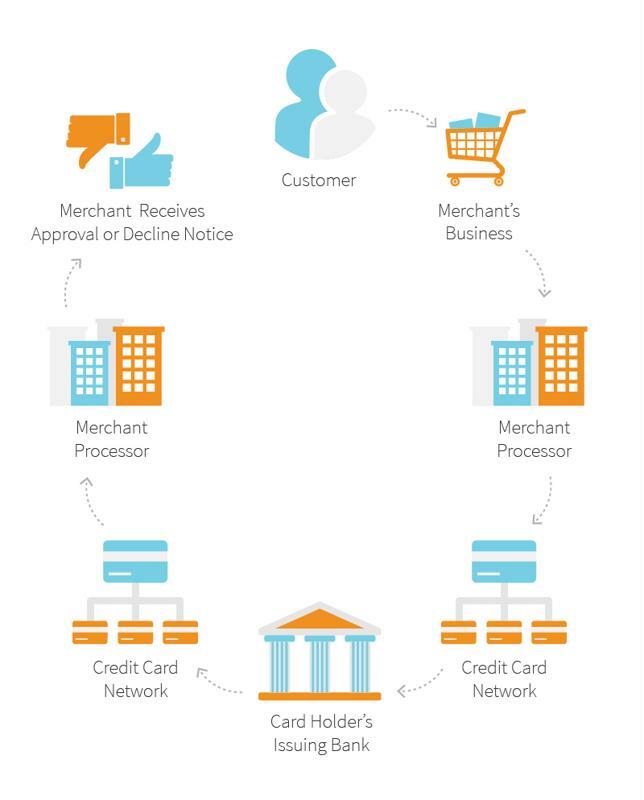 The merchant: This is the business providing the products or services for which the customer or cardholder is making a purchase. In some cases, merchants prefer a third party to act on their behalf rather than open their own merchant account. This third party is referred to as the "merchant of record" (see below). Merchant of record: This is the entity that is held liable by the financial institution to process credit and debit card transactions. Many small startups and businesses may prefer to work through a third-party merchant of record. The payment gateway: These are organizations that help merchants connect to payment processors and/or acquirers (see definitions below). In some cases, a payment processor will offer its own gateway. Beyond offering connectivity these gateways offer peripheral services like fraud screening or PCI compliance services. We'll talk more about PCI later. The payment processor: These companies process transactions on behalf of the merchant and submit transactions to the card associations for processing. The credit card associations: The most well-known and widely accepted card networks are Visa and Mastercard. They operate a global processing network that connects to the issuing banks. The issuing bank: These are the banks and financial institutions that issue the credit cards to consumers and other cardholders. The acquiring bank: This is the bank from which the funds derived from credit card payments are deposited for the merchant. The acquirer is responsible for all financial and compliance risks associated with a card transaction. The diagram below depicts the flow of data and payments among the above players in a credit card payment scenario. 1. Interchange fees. Interchange is a schedule of fees set by the various card schemes or network operators (Visa, Mastercard, American Express). These fees are passed through to the card issuer (Chase, Bank of America, etc.). Interchange fees are generally charged as a percentage of the transaction sum plus a flat fee, e.g., 1.75% of the transaction sum plus $0.20 per transaction. The interchange fees don't vary by payment processor and are essentially set and non-negotiable. However, interchange fees will vary according to the following parameters. 2. Dues and assessments. This category includes a variety of fees, mostly small fees, charged by the card schemes. These fees are usually paid to the card schemes as opposed to the card issuers or the acquiring banks. These fees are typically fixed. When there is a separate payment gateway service, perhaps providing integration to multiple payment service providers, the payment gateway will charge a fee for each transaction. Payment gateways typically charge a flat fee per transaction for gateway fees. Sometimes, Gateway fees are bundled with additional services. Merchant processor fees are set by and paid to the payment processor (as opposed to the interchange fees that are charged by the credit card schemes or network operators). It is important to verify which fees are included and which are not in the terms of your agreement with a payment processor. Payment processors have well-established infrastructures and fee schedule arrangements in place to support all types of merchant payments. The payment processor will vary these fees based on the various services (digital, physical, content) being provided with the service. In the case of passthrough pricing, the payment processors pass through the charges without any markup and in the case of bundled discount rate the payment processor combines all the charges into a single discount rate to the merchant. Cross border fee – A cross border fee is the fee charged to a merchant by the payment processor when a customer uses a credit card as payment for purchases or services from an issuing bank not located in the same country as the merchant's processing account. 3D Secure – 3D Secure is an additional security layer for online credit and debit card transactions. The rates charged to the merchant for card-not-present transactions could be affected by the merchant implementing 3D Secure as part of the purchase process. Chargeback fee – A chargeback results when a customer disputes a charge on his or her credit card and the funds need to be returned to the customer's account. After a chargeback has been initiated by the issuing bank, a chargeback fee will be applied to the merchant for handling of the chargeback process. (The charged amount is also returned to the customer). Gateway fees – When a payment processor also provides the gateway services, there will be a separate charge for these services. Chargeback service – The payment processor or other party may offer a service to defend against chargebacks, for example, in cases where the chargeback is potentially fraudulent. Payment processors charge for this service. Batch processing fee – In some cases, a merchant will process transactions by submitting a batch file to the payment processor. The payment processor may charge for this service. Monthly minimum fee – This fee may be charged to a merchant who does not reach a certain transaction total for the month or year. Monthly fees – The payment processor may charge a monthly fee on top of all other charges. Account set-up fee – Some payment processors charge an account set-up fee. Terminal fee – If the merchant is using point-of-sale (POS) terminals, the payment processor may charge for those terminals on a one-time or recurring basis. I hope that this summary of the ecosystem players and fee types has helped clarify who can charge you for what. The large number of players and fees charged to merchants in the credit card ecosystem can easily confuse merchants and leave them with little desire to drill down and really understand what they are being charged for, and by whom. Understandably, many merchants may be tempted to go for the easy options or the standard options but they may well find themselves paying more than they need to. Even small differences in fees when multiplied over thousands of payment transactions can accumulate into substantial sums that you are either spending or saving. Therefore, it is important to understand the players and concepts in the ecosystem, decipher what you are being charged for, and learn how to shop around, compare prices, and choose the best deal. Michael Greco is Vice President of Asia Pacific at Vindicia and is responsible for leading the company’s initiatives and expansion in the region. Michael brings more than twenty years of experience in Asia Pacific sales organizations at Lucent, Lenovo, Juniper Networks and NTT. He holds a BSEE degree in Communications from George Washington University.